It doesn’t always work. Not with a Nokia anyway…. It’s been a disappointing Bank Holiday weekend. And not just because of the rain. 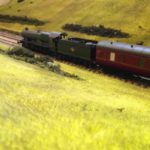 This blog is about sharing model railway building tips and experiences. 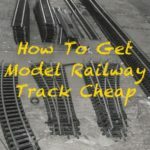 And most of the time I post tips and techniques that I or other modellers have found useful. But of course sharing advice about things that don’t work is just as useful. 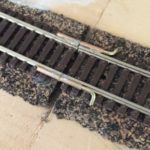 This post is about one such idea, a way of fixing rail sticky points, that I’ve I spent the Bank holiday weekend trying but found not to work. Hopefully, it’ll save someone from wasting their time also trying it or give you idea for an alternative approach that does work. Anyway, on with the idea. 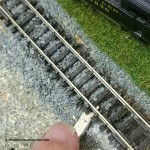 I’d read in several places (happy to credit if someone has a link) how some modellers use small motors to vibrate the rails at places where their trains stop to nudge them on. A flick of a switch starts a vibrating unit which rocks the locomotive just enough to get it past the difficult patch. Except it didn’t work for me. I have precisely the kind of flaky track spot this trick is designed for. The rails have been cleaned, it’s not on a joint and I’ve examined it under a magnifying glass and with track gauges. 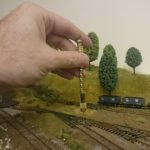 It seems fine but most of my fleet of loco’s will get stumped there. 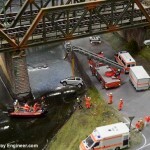 A tiny ‘hand of God’ nudge gets the trains over the difficulty and they then continue on from there perfectly. But that stop gets me EVERY time. In theory, goes the idea, a tiny motor that vibrates the rails and the wheels so moving them ever so slightly should do the trick and save me having to lean across the layout. I’d read here that another modeller used the vibration unit from an old mobile phone. And as luck would have it I had an old Nokia 7210 kicking around. I took it apart and recovered the vibration unit from it. It’s a pretty simple component. A tiny motor with an unbalanced assembly on the shaft. When the shift rotates the unbalanced weight causes a vibration. Two electrical contacts on the top were wired with a switch and small Lithium battery and the unit itself discreetly attached the sleepers near the troublesome spot. (if the technique worked I’d find a more discreet way of attaching it). A loco was sent around the track and sure enough stopped precisely where I expected. Leaving the speed dial turned up I flicked the switch to the vibration motor and waited expectantly. But instead, I got a big fat nothing. My otherwise trusty Graham Farish logo just sat there. Stuck. I reversed it and thought again. Maybe if the vibration motor was running as the train approached the ‘spot of stickiness’ the combination of momentum and shaking would see it through. I’ve tried other approaches. Attaching the motor directly to the rails and to the baseboard. Back to the drawing board for a remedy to the spot of stickiness but if this saves someone similar effort or if it inspires someone in another way it’ll have been worth taking apart my old Nokia on a rainy Bank Holiday weekend. Footnote: Boris S. on Instagram has already suggested an alternative use for the motor! Not a wasted weekend after all. Watch for a follow-up post soon. I have used a similar motor to vibrate a man oprating a pneumatic drill in a roadworks scene. The motor I used was a little larger than the phone variety and I think its intended use was in some form of, ahem… massaging device. To get the best vibrating effect, I used a variable voltage regulator to run the motor at the optimum speed. You could probably get the same effect by attaching an electrical screw terminal to the shaft of any small motor to provide an offset weight. Hi Neil, I’ll get hold of a regulator and go it a go. Thanks!